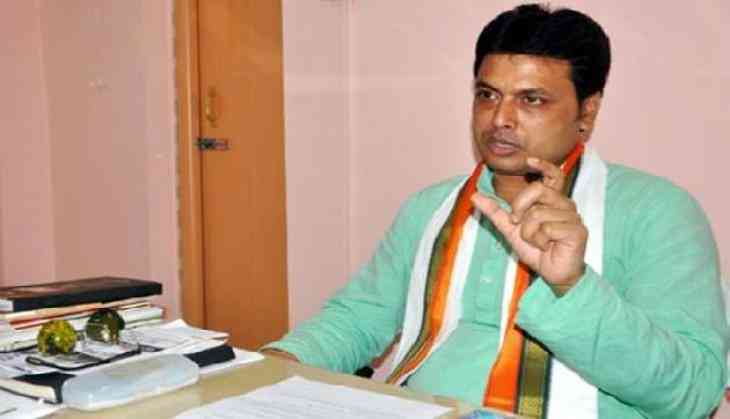 The Tripura unit of the Congress has lodged a complaint with the Election Commission, seeking the immediate arrest of Chief Minister Biplab Kumar Deb for allegedly spreading communal hatred in the state. Tripura Pradesh Congress vice-president Tapas Dey filed the complaint on Friday with Chief Electoral Officer (CEO) Sriram Taranikanti, accusing Mr Deb of repeatedly making false statements with "a motive to divide communities in the state on the lines of caste, creed and religion". Mr Dey also called for the chief minister's immediate arrest. "Our party has urged the CEO to register an FIR against Deb for his immediate detention to judicial custody," another state Congress leader said. Mr Dey also claimed that BJP activists were threatening voters to not go to the polling stations and were attacking Congress workers and candidates. Bhattacharya alleged that the slogan -- "Poila Jati, Ulo Party (caste is first and then political parties)" -- in indigenous Kokbarak language had communal overtones. "This phrase raised by Deb Burman had communal hints. Let EC investigate the truth, and then everything would be clear to the people," he told PTI. In Tripura, there are 23 tribal communities, together constituting one third of the state's population.